Why would you need the miter saw when the table saw can do whatever a miter saw can? Because as a homeowner, there are many home projects you want to accomplish within a day, therefore you need something handy to perform the cut as quick as possible. Miter saw can perform 4 types of cuts, which are cross﻿﻿ ﻿﻿cut, miter cut, bevel cut and compound cut (combine miter cut with bevel cut). These cuts are suitable for projects like picture framing, crown molding, laminate flooring, finish carpentry and trim work. There are many miter saw brands in the market, so which one is the best? I’ll answer you with my list of best miter saw 2019. With my experience, I’ll pick out the miter saw to buy. I hope you can rely on the information I provide to get the miter saw for your DIY projects. Conclusion – What is the best miter saw? This is a corded power miter saw with 12 inches blade for maximum cutting capacity. It’s a powerful single-bevel compound miter saw that cut butter through base board, crown molding and wood. Besides, most users also praise this miter saw for the extreme center balance. This is basically one of the best Dewalt miter saws. 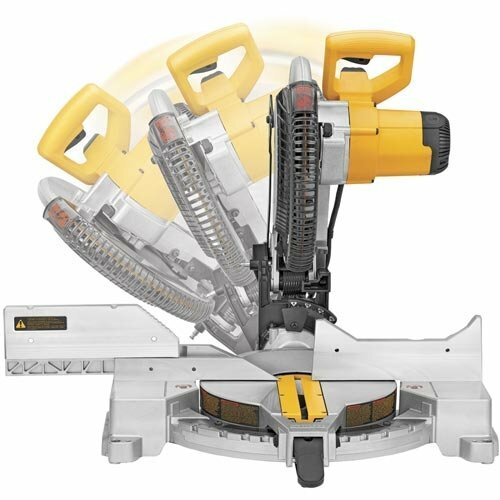 Versatile – This is a miter saw using a 12 inches blade that gives more cutting capacity, which is necessary for performing angle cuts with wide stock. On top of that, the tall sliding fence can deal with crown molding and base molding up to 5-1/4 inches and 6-1/2 inches respectively. Powerful – Using the 15 amp power, this miter saw produces a no load speed of 4,000 rpm. It is capable of making quick cut through any sort of hard wood. It ensures that every cut has a smooth and finished edge. Lightweight – As expected, this miter saw only weighs nearly 42 pounds, with its easy-to-use locking pin and custom molded carry handle, you can carry the saw around at ease. Adjustable detent plate – For precise repetitive cuts, this adjustable detent plate provides 11 positive stops to maximize the accuracy and productivity of performing repetitive cuts. Various miter/bevel options – The bevel cut capacity is 0-48 degrees to the left and 0-3 degrees to the right. For miter capacity, you have 0-50 degrees options for both left and right. No laser guide – This model does not support visual indicators like its predecessor (type 2). Unless your work needs perfect precision, you won’t be using this feature too often anyway. Low dust collection capacity – The capacity of this miter saw only allows it to collect half of the saw dust produced while sawing. It means that you have to stop the entire a work to empty the dust bag, which really makes your productivity goes down. So what is the miter saw for crown molding, cutting baseboard and woodworking? It definitely is this one here with its incredible cutting capacity that can handle projects like those. On top of that, you have excellent center balance and 3-year warranty for peace of use. With a quite affordable price, this miter saw deserves to be the best miter saw for the money. 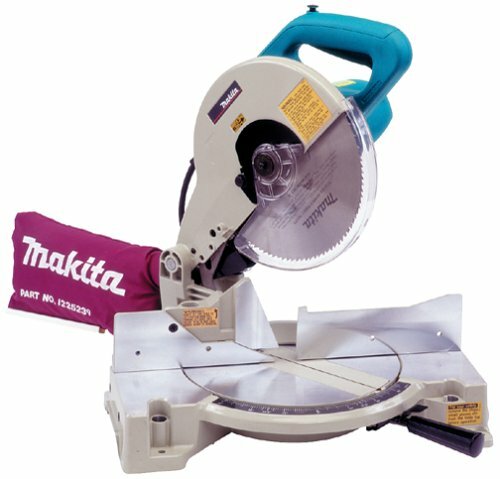 This miter saw is among the least expensive miter saw on this list. It is the most affordable one with features designed for newcomer. 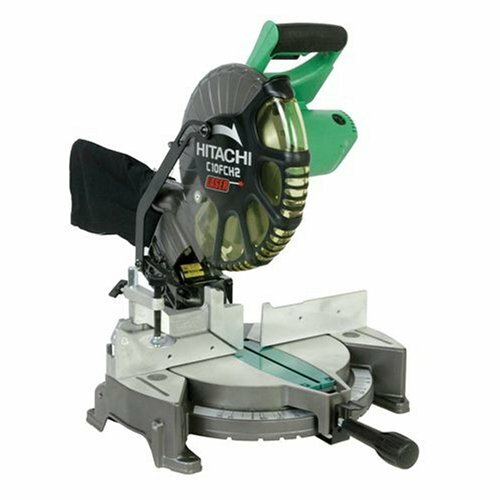 The focus of this miter saw is the simple mechanism that eliminates all the complexion of using a miter saw. This saw is suitable for homeowners with tight budget and less professional DIY experience. Owing to the price and the ease of use, this is good for home use. 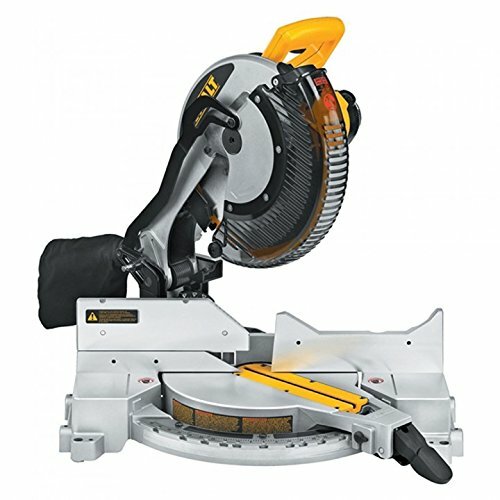 Better metering and beveling with compound feature – This miter saw has bevel capacity of 0-45 degrees to the left, and miter capacity of 0-52 degrees to both sides, coupled with 10 inches saw blade allow easy crown molding and trim work. Moreover, the extended flip fence raises to 4 inches, ensure perfect precision for cutting of large work pieces up to 2-5/16 inches high and 5-21/32 inches deep. It also helps cut crown molding vertically. Laser guide – Even with lower price, this miter saw still affords a piece of technology that is missing in other saws, the laser guide. It is a necessary guide tool for newcomers who don’t cut frequently. Powerful – It is impressive that this miter saw can produce the speed of 5,000 rpm with the 15 amp motor. With such a speed range, smooth cut can surely accomplish at ease on any tough project. 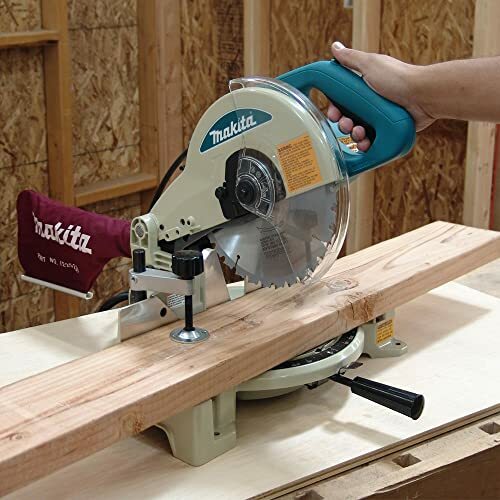 Ease of use – This is where this miter saw wins points and it's good for home projects. Hitachi offers you a horizontal handle with low vibration elastomer grip to keep hand fatigue from getting to you. With only 26.5 pounds, the miter saw is the most portable miter saw on the list. Adding to that is the maximum control you will gain over this miter saw due to its lightweight. It's a compound miter saw for DIY – This miter saw obviously aims to homeowners with tight budget and low experience. The price of this product is really competitive compared to its peers. Any homeowner with a humble investment can afford this miter saw. 5-year warranty – You have 5-year warranty and 30-day satisfaction guarantee on the product within this price range? What a real bargain you’ve got there. Hassle blade change mechanism – Most complaints about this miter saw lay on the blade change problem. It’s tough to replace because the blade guard locks very tight that it requires a lot of strength to remove the blade off. This miter saw works just fine after all. I highly recommend it at beginner level. The ease of use is the highlight of this saw. The next impressive factor is the price; you will hardly see any miter with this power and speed in this price basket. More importantly, you have 5-year warranty for extreme peace of use. This miter saw is a real bargain for any homeowner. Although the blade change system is quite bad, you can’t demand too much from a miter saw at this price anyway. This miter saw has the highest bevel capacity and miter capacity on the list, allowing you to perform the finest finish carpentry tasks. It includes all the tasks like picture framing, woodworking, laminate flooring and trim work. The good news is that this is another miter saw that is quite affordable. One more unique thing about this saw is the electric brake to stop the saw blade for more productivity. Outdoor/Indoor woodworking – With its cutting capacity, the miter saw can handle most of the wood pieces. 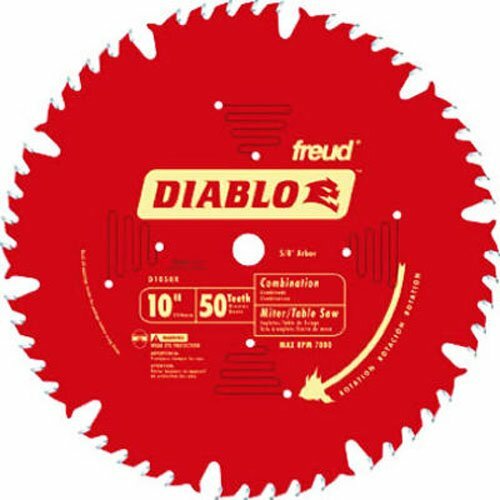 The cutting depth is suitable for most applications in light construction, outdoor/indoor woodworking, while the cutting width is also applicable for most tasks on the jobsite. Picture framing – It is possible to make a double action cut with this saw since the motor attaches itself to a pivoting post, enabling the blade to swing both side to side and at an angle to the object. It’s the best miter saw for making picture frame. Trim work – When I think about trim work, precision is what comes first in my mind. For your information, the miter saw has a single bevel action capable of swinging 45 degrees to the left side. 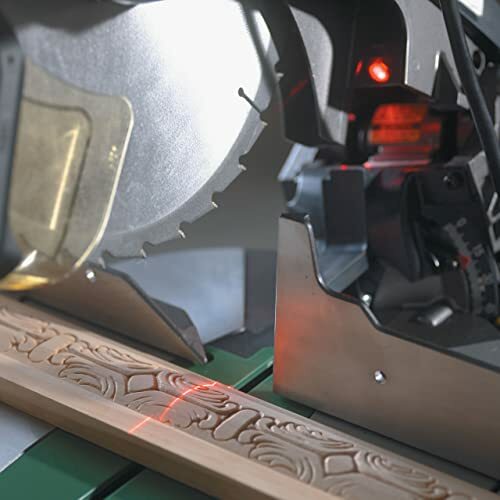 To support the precision for your cut, the manufacturer also adds a laser guide to illuminate your work surface. Also, you get an aluminum base designed to ensure the accuracy of each cut. Laminate flooring - With higher speed, you gain more accuracy and smoothness in every cut. This is important for laminate flooring, since you want each piece to look as smooth as possible on the two ends. Electric brake - You have an electric brake that stops the saw blade immediately after every cut. As you stop the blade completely, you are free to initiate the new cut right away. Consequently, you will save a lot of time with this feature. Dust collection – If you are familiar with miter saws, you may know that most dust collection system won’t work properly. Fortunately, this miter saw has a dust collection system that works just fine. It’s not the best dust collection system out there, but it does a bit better job than those of others. Hassle adjustment mechanism – Many users complained that they had trouble adjusting for the angle cut. Truly, the adjusting process is a bit complicated. Fortunately, everything is included in the instruction manual. Before using the miter saw, take some time to read the manual about how the adjustment mechanism works. This miter saw is a plausible solution for any carpenter or woodworker with really tight budget. 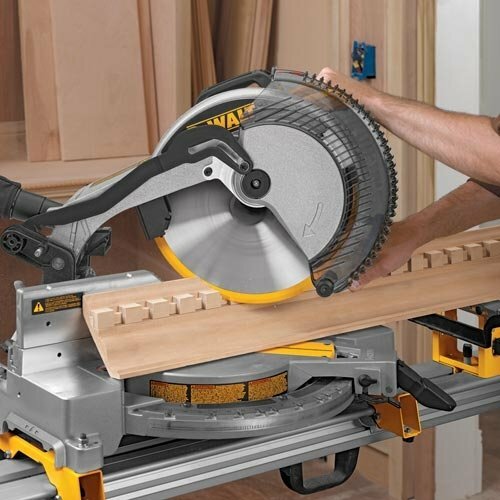 With the high cutting capacity, it can handle picture framing, trim work and finish carpentry. 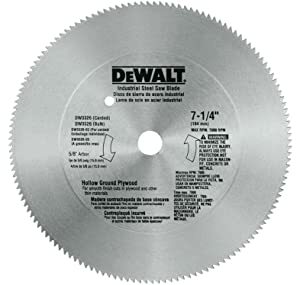 Plywood blade – Recommended for cutting paneling, moldings, and engineered flooring. Combination blade – Usually used for cutting laminates, harder exotic hardwood, and precision miter cutting. It will depend on your purpose yet I still recommend putting safety as your first priority. Also, the secret of smooth cut also comes from the application of the right blade. So make sure to check some blade selection tips on the Internet beforehand. Likewise, you better get a saw with laser guide for more precision. Overall, the best rated miter saw on this list is the Makita LS1040. I hope you enjoy this article, have a nice day.